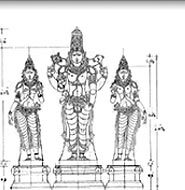 SRI VAIDYANATHA STHAPATI ASSOCIATES a leading professional group in the field of Architecture and sculpture has been named after the renowned Master Architect Sri. M. Vaidyanatha Sthapati , the designer and builder of Mahatma Gandhi Memorial mandapam at Chennai, TamilNadu.. He is the grandfather of Sthapati R.Selvanathan, the founder and Chairman of this concern.